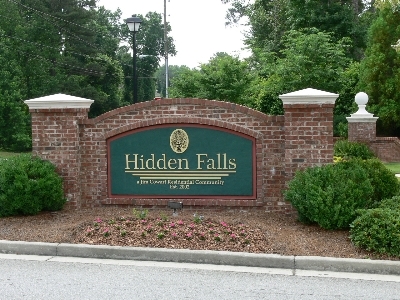 Hidden Falls is a beautiful community located in Northwest Gwinnett County on Camp Branch Road, just minutes from I-85 and the Mall of Georgia. Hidden Falls has 190 wooded homesites and features award-winning amenities offering a clubhouse, fitness center, competition-size swimming pool which includes children's mushroom feature, children's playground, four lighted tennis courts and sidewalks throughout. Additionally, the breathtaking, natural waterfall located on the property is a soothing retreat for homeowners. This community offers classic brick custom homes built by Certified Professional Home Builders. The neighborhood is close to shopping, Lake Lanier, the North Georgia Mountains and perfect for establishing your own family traditions in Gwinnett County.You'll love the family-friendly amenities and beautiful landscaping that this community has to offer. The spacious, 2-story, brick and stone homes feature 4-5 bedrooms, 3-4 baths, structured wiring, 3 & 4 sides brick, full basements, 3-car garages and more! Many optional upgrades are available as well as level, wooded lots. Prices for homes are offered from the low $500's.